The attacker was captured on security camera footage walking away from the scene with what looks like a water bottle in hand. QUEENS — A stranger called a 13-year-old girl a "white b---h" before throwing an unknown liquid in her face in Richmond Hill Tuesday in what police are investigating as a hate crime, police said. The victim had just gotten off the Q10 bus at Lefferts Boulevard and 101th Avenue about 3:25 p.m. when the suspect, whom she didn't know, approached her from behind, officials said. When the girl turned around, the man splashed the liquid in her eyes, causing them to burn, and called her a "white b--h," according to police. She was treated at and released from Jamaica Hospital. The victim managed to take a photo of the suspect as he walked away, police said. Investigators also released security camera footage of the suspect captured nearby. The video showed the man carrying what looks like a water bottle, walking away as he looked back over his shoulder. 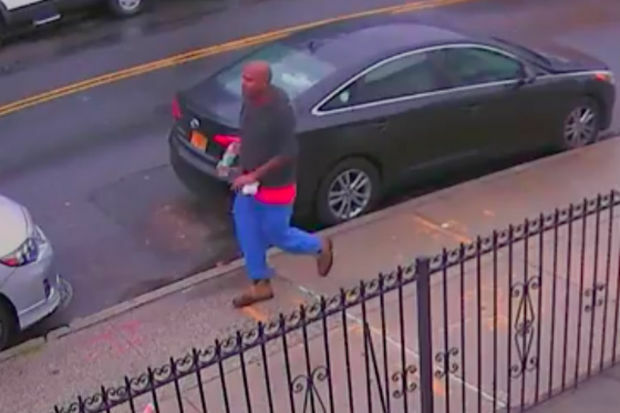 The attacker, who is in his 30s, fled along Lefferts Boulevard and hadn't been arrested as of Wednesday morning, police said. It wasn't immediately clear why he attacked her, police said. He wore a dark hooded sweatshirt with a red shirt underneath, blue pants and brown boots, according to police. The NYPD's Hate Crime Task Force is investigating the incident, police said. Anyone with information about this cas call the NYPD's Crime Stoppers Hotline at 1-800-577-TIPS (8477).